Do you love Popeyes? Like, really, really love Popeyes? Would you do anything for that Bonafide Chicken, those signature sides, that Bayou Buffalo sauce? If the answer is yes, you might be intrigued to know that Popeyes has created a 12-Hour Drive Thru to celebrate its 12-hour marinating process. This could be the ultimate test to show how far you’re willing to go for your chicken fix, and separate the true fans from the rest. 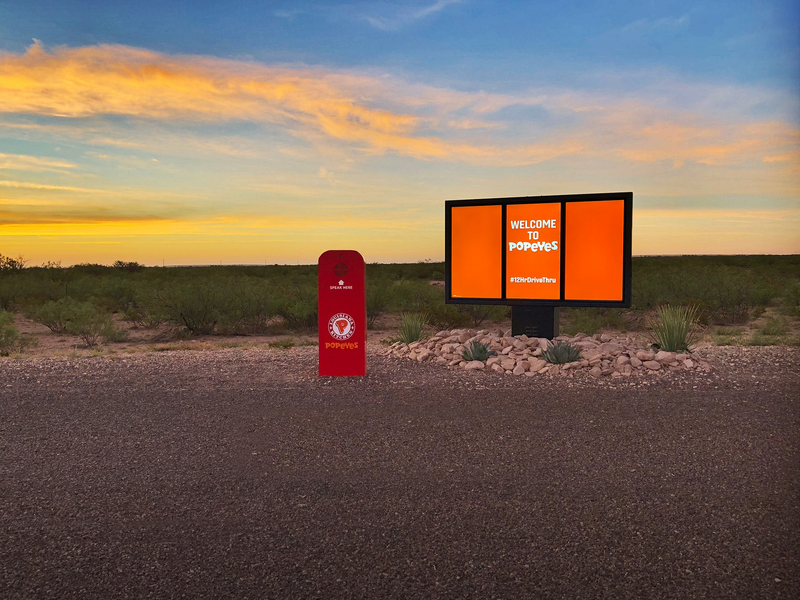 Here’s how it works: Fans place their order at a standalone drive-thru menu board located in Fort Stockton, Texas, a small town on Highway 10. After a 12-hour and 800+ mile drive, orders will be ready for pickup at the flagship Popeyes store location on Canal Street in New Orleans, where the brave adventurers who undertook this journey will receive their meals for free. The point of the journey? To show travelers how long a 12-hour marinating process actually is and to celebrate the great taste of Popeyes chicken. A perfect adventure for roadtrippers and chicken lovers alike, the 12-Hour Drive Thru will officially open on November 9th, but die-hard chicken lovers can get a jump start earlier with some major perks – those who get to Fort Stockton, Texas, and order their meals sometime between noon on Friday, Nov. 2 and noon on Saturday, Nov. 3 might be among the 12 people to win 12 months of free Popeyes. Just apply online by Oct. 26th and find out if you’re one of the chosen ones. The application is fairly straightforward. In addition to your contact information, it asks for up to 250 characters topics like, “How much do you love that chicken from Popeyes?” and “Are you spicy or mild? Why?” After confirming that you have a valid license and insured vehicle, you submit the app and wait to hear back. For a true Popeyes fan, waiting around to win a year’s worth of free fried chicken may even be more stressful than waiting to hear back from colleges. U.S. residents who participate must be 18 years or older and the prize will be awarded in the form of $360 worth of Popeyes gift cards. But the drive-thru window in Fort Stockton is open to anyone at any time, as long as you commit to traversing the rest of Texas and Louisana for your meal. Not everyone will have free Popeyes for a year at the end of their journey, but they’ll certainly have a free meal in one of the most vibrant cities in the country, which also happens to be the birthplace of the fried chicken chain. Love chicken but can’t commit to a road trip for it? Popeyes is still offering 12 months of free food you can win from your couch – just share the video on Twitter and use the hashtag #12HrDriveThru and #PopeyesSweepstakes. Good luck and happy driving!